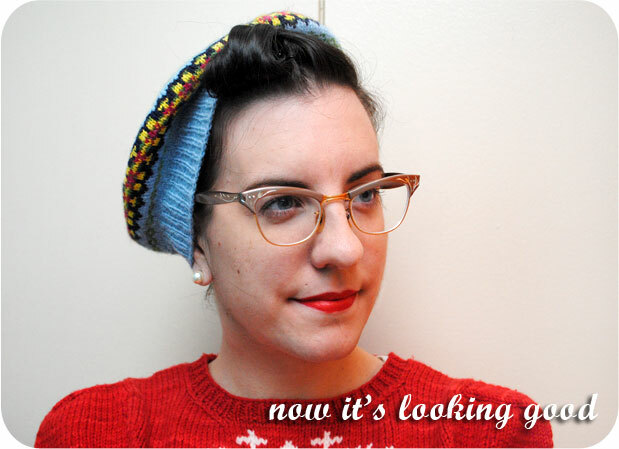 Today I’m finally sharing a little tutorial I’ve thought about all autumn, as I’ve lazily enjoyed wearing berets quite frequently. 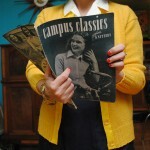 I love berets (tams, tammys… call them what you will). They are my favorite hat to wear, and my favorite hat to knit, too. 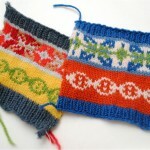 You can knit cabled ones, fair isle ones, slouchy ones, you name it. And finding vintage berets isn’t usually too difficult, either. As an added bonus, felt berets haven’t changed much over the years, so you can buy modern ones that look just as vintage. 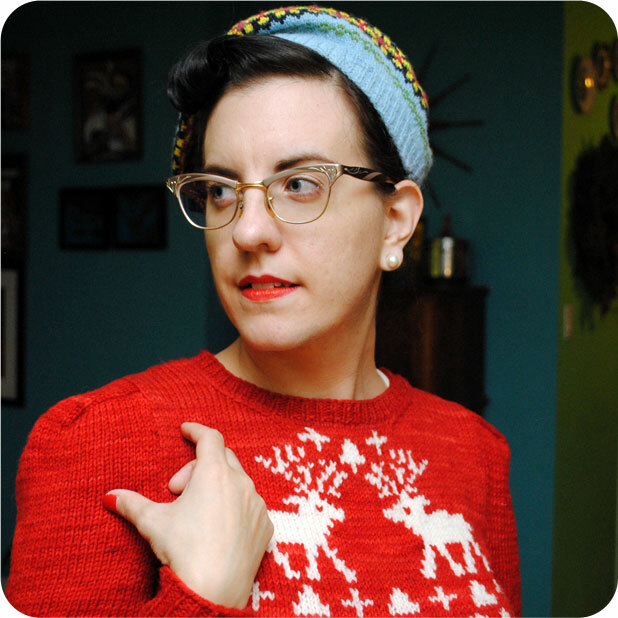 You can use any kind of beret—vintage, modern or hand-knit—but you’ll only be able to do the little shaping trick I do with the brim with a knit beret. If you’re using a felt beret, just skip that step when you get to it. A bit of laziness, your head of hair, a beret, a few bobby pins, a few bun pins, two hair clips and a little pomade. This is so quick and easy. We’re talking 5 minutes, tops. Part your hair like you normally do. 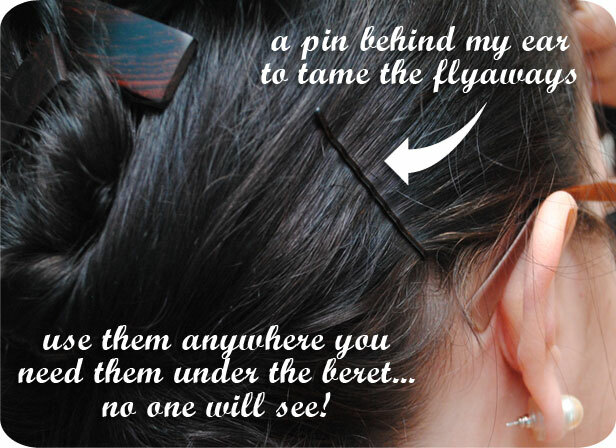 On the lighter side of your party, twist that half of your hair up onto your head, and secure with a hair clip. If you have longer hair, you will probably need to place the clip higher than I did. Do the same thing on the other half of your hair. This time, leave out a front section or long bangs if you have them. That’s the hair you will turn into a front roll. 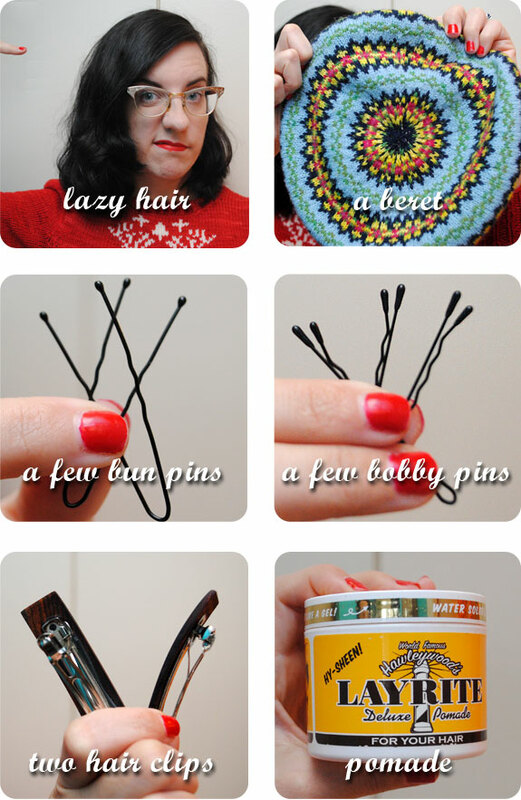 If your hair is prone to flyaways or is ornery, use a few bobby pins anywhere you need them. For me that’s behind my ears, and sometimes at the base of my neck now that my hair is shorter. Now we’re going to work on the front roll. Put a small amount of pomade on the fingertips of one hand. 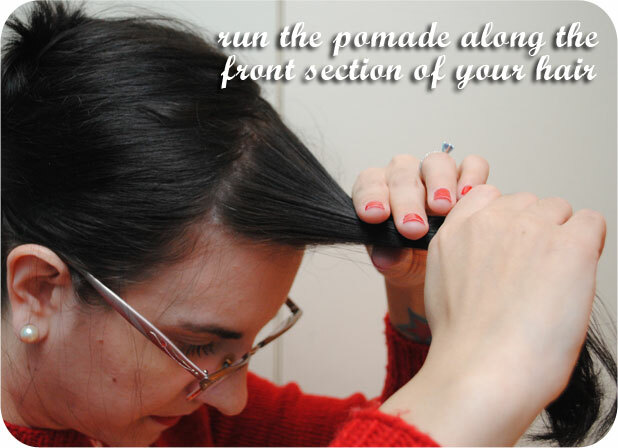 Run the pomade along your hair. 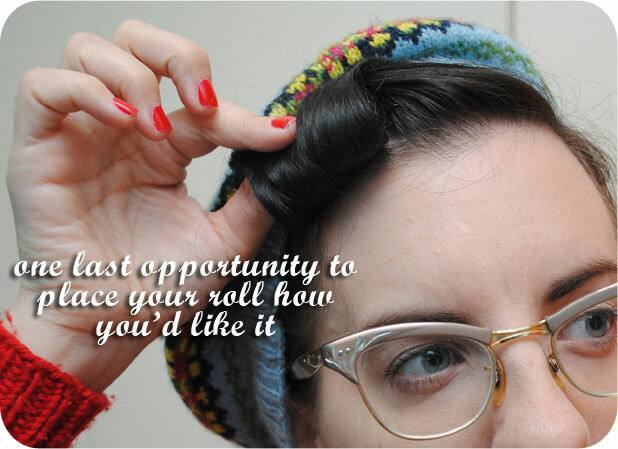 My tip for a good front roll is to keep the hair getting rolled relatively taut while you’re rolling. If I relax my arms too much, the hair tends to get floppier and the result is crappy looking. So as you roll, keep slightly pulling on the hair away from your head. Start off by pulling the hair in the direction you will tilt your beret. In my case that’s away from my part. (No particular reason, just habit.) I don’t backcomb this hair first, but if you need a bit of fullness, go right ahead. Now it’s a roll, yay! But don’t get frustrated if it takes you a few tries. And if you just can’t get the roll to work, here’s a tip from my hair stylist: wet down the section of hair you want to roll first, then put in the pomade, then blow it dry. It changes the texture of the hair somewhat and makes it a bit more stiff, so it’s easier to roll. Time for the beret. Now a lot of people say berets don’t look good on them. I think that’s sometimes because they put a beret on and without fiddling with it, immediately declare that it looks bad. The trick is that you need to spend a moment or two orienting it on your head just the way you like it to get it to look good. Because otherwise yeah, it will look bad. 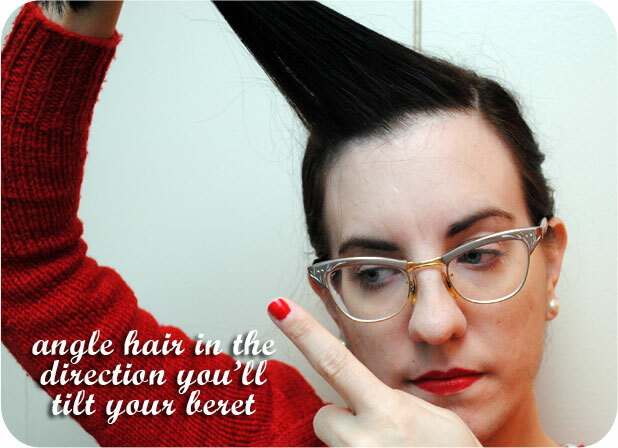 Put the beret on, making sure all of your hair except the roll gets up into it. (And if you don’t want to do a roll you can pull the beret further forward onto your forehead if you’d like). Play around with it until you’re happy with how it looks. I often like to tilt it pretty significantly to one side, and pull the brim rather flat and forwards, as I’ve done here. If you’re wearing a knit beret and have the brim placed the way you like it, you can use one or two bun pins to keep the nice shape. Simply push the pin in and back out just under the edge of the brim, and push it into the part of the beret against your head. Push the pin back away from your face. You won’t be able to see it at all. Now that your beret is on and secured, if you’d like to maneuver your roll a little bit, do so now. You can gently tug on it to move it lower onto your forehead, or further down the side of your head, or widen it (you might need to move a bobby pin or two). Once done, give it a good spritz with hairspray. That’s all there is to it! Here’s the finished results from all angles. So that’s my quick way to look stylish and put-together while being lazy and dealing with a blustery day. It’s great when you don’t feel like setting your hair, or maybe your hair needs to be washed, or you just can’t stand the thought of wind gusts wreaking havoc with your locks. Hope you enjoyed this little tutorial. Now go be lazy, wind-resistant and fetching in your beret, all at the same time! This post is ideal for lazy girls like me, I always roll on the front, do not take off even to sleep, so I always keep the fold. But I had never thought of putting all icapelli into the hat. You are just too darn cute! This looks adorable on you! I would try it out, but I have so much (long) hair, I’d need a huge rastafarian tam, LOL! This looks adorable!! I’ll have to try it out: my college campus is next to a great big lake, so it’s really windy all day every day 🙁 At least I have a grand excuse to buy some cute hats now! I love this! :] Thanks! I adore all your cute lil hats!!!! I wear berets almost every day now that winter has arrived in Canada. Not only because it is cold, but I can be lazy with my hair, and make a pincurl set last for days without having to restyle. A lil dry shampoo spritzed in the front, angled beret, a few bobby pins, and voila! Good idea! 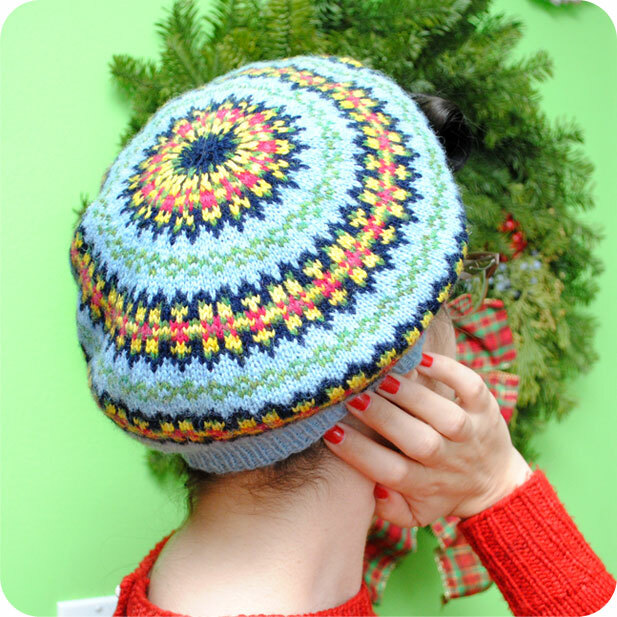 I just finished the Pictorial Beret from A Stitch in Time, I may just try this out next week. I have a bad hair day more or less every other day, so this really comes in handy. 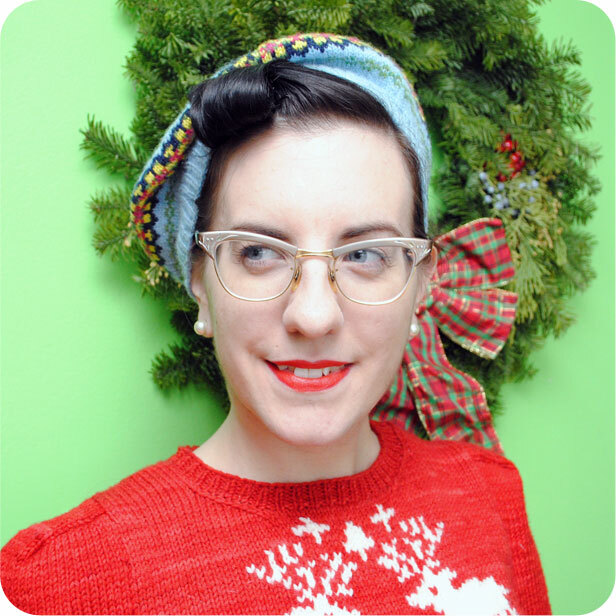 The beret and the Christmas sweater are just gorgeous. Fab tute! Hats are my SAVIOURS this time of year! 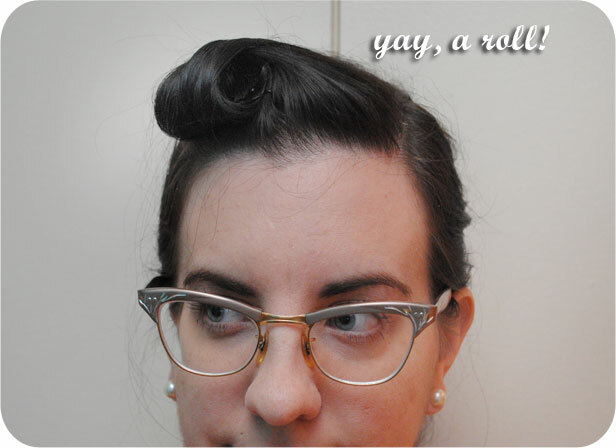 I have recently discovered the JOY of using pomade to create rolls. SO easy!! And not crispy like the mousse I sometimes use. ps) I am still eyeing your beret enviously. Muchous. So cute! I finally unearthed the few berets I have (a couple knit ones and a black felt beret that I have no idea where it came from… lol) and have been wearing them constantly! Partly because I haven’t had time to do exciting styles/sets, and also because I’m kind of hating the length of my hair at the moment. 😉 It’s a great way to hide everything! 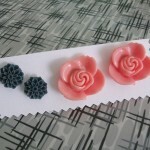 Love the cute curl you added–will have to try that soon! 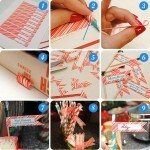 So clever and looks so lovely! Thanks, I shall have to try this. Looks great! I think we have fairly similar hair quality, so it’s always interesting to see how you style it. Once you’ve done this style, do you just keep your beret on all day? Doesn’t it get hot and itchy when you’re inside? what wonderful and original tutorial- thanks! I’m a confirmed beret fan. I have about 4 ..and counting. I’ve recently discovered the joys of rolling up my fringe especially on windy days. Berets are also great when you want to leave your hair in curls (so they last all evening) but still go about your day without looking a bit loony. I pincurl my ‘mildy damp’ hair roll up the fringe and put on beret…and no one can tell. I love berets! unfortunately I lost mine during a train ride last year. Now I want to get a new and will definitely pin it in place this time!